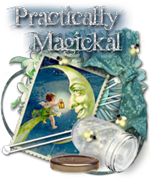 Gosh, it is hard to believe that it has been 5 months since I posted anything here at Practically Magickal. I had all the good intentions in the world to stay current with my recommendations of other artist work but I got bogged down in life. It is my hope that I will be able to take the time once a week to continue to highlight other's work. I also hope that I will be able to bring to you folks you may not already know about. I also am going to have some guest bloggers to tell of their art experience, journey or perhaps even offer a tutorial on their preferred media. I have introduced you to the wonderfully talented and totally awesome Sharon Henry from Plumrose Lane before but this is a good place to begin again. In the past few months Sharon has had the unbelieveable task of retreiving all her computer design files from one source and find a more suitable storage home for them. We're talking thousands of files. She has been a phenom when it comes to taking care of her clients and helping reinstall backgrounds, badges, headers.....you name it Ms. Sharon has been on the job. I so admire her talent when it comes to all things computer, but more than that I admire her work ethic. She will not leave a client hanging. She is right there to make it right, as painless as possible and does so with a grace and light that makes me so happy to call her friend and I am one of her biggest fans. She is a beautiful lady inside and out. If you need a makeover for your blog, a zippy new facebook page topper, a custom anything for your computer, please know that when you call on Sharon, she will be there for you all the way from beginning to end. I highly recommend her and her work. Here's my new badge for this blog. Isn't it wonderful?????? So go to the sidebar, capture my badge, come back and see me and I'll introduce you to more lovely folks. I love your new badge! Love the new badge. Sharon did good.